MARCH 2016 ~ COVER PHOTO “Michelle & Tommy” by Brent Fraken. 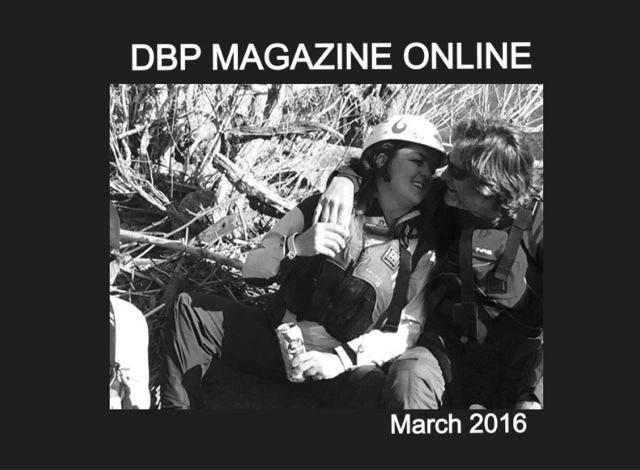 Stories byMichelle Terrell and Tommy Hammit | DBP MAGAZINE ONLINE The World's Best Free Whitewater Publication. March for the paddling community here in America means a return to regular boating, albeit cold water and melt flows. Spring begins in March, the season of renewal, of fresh starts, of warmth, of love. I wished for a photo for this month’s cover photo that would somehow convey all of these separate but interconnected aspects. I knew I’d found the image that would capture all of this as soon as I saw it. The third weekend of February a small group of the DBP MAGAZINE ONLINE Staff met up with local friends Michelle and Tommy to cover the National Paddling Film Festival in Frankfort, KY. That Saturday had beautiful, Springlike weather, so we all decided to paddle in the Not-NPFF Race on nearby Elkhorn Creek. Part of the way down, we pulled over to enjoy a PBR, where we met up with our shore support crew, DBP Admin Dave Hendrickson and his friends from Indiana. One friend, Brent Fraken, quietly took some photos of the moment, and the one chosen as the cover in particular stood out straight away for the feelings captured within. Michelle and Tommy were shown in a tender moment amidst the bustle of us all talking and enjoying our day on the river. I asked them to talk a bit about love, the river, renewal, and what it means to be a dirtbag. Tommy: “I was born in California into a Navy family and for the first 15 years of my life I lived on or near the ocean. Florida was the last stop before Dad retired in Kentucky. I learned to surf while in Florida and it took some getting used to fresh water when I was no longer near the ocean. I’ve always felt there was water running through my veins, salt water, and when I arrived in Central Kentucky, I needed to be outside and near the water, so I took to hiking, always finding waterfalls and other rushing water. It wasn’t until years later that I began to take the canoe out when the creeks were near flood stage. I was known to cruise down high water situations in the local creeks with nothing but a swimsuit, and I loved travelling down fast water currents. I was a water dog, but never really knew anyone who had water flowing through their veins as I did until much, much later. I met Michelle during a fall hike one day and all she could talk about was whitewater and the Gauley Festival she had attended just two weeks before (Gauley Fest 2014). I knew immediately I had met a friend for life! She loves all the things I love, the great outdoors, and especially the thrill of being on moving water. I told her I loved her way before I fell in love with her because I knew I had met someone special. 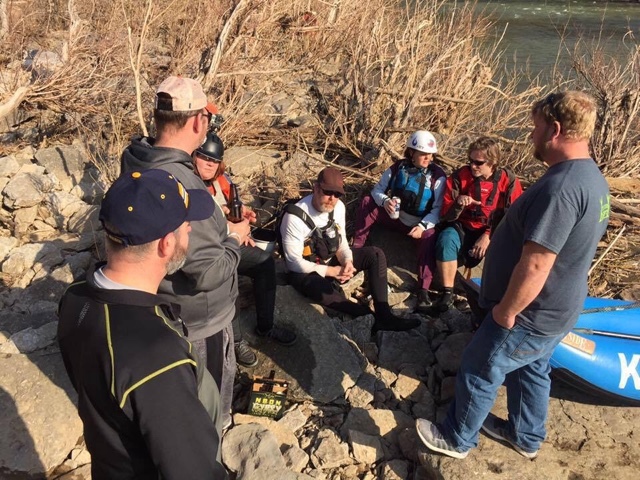 So over the next few months while waiting on spring to arrive, we discussed the possibilities of meeting the Dirtbag paddlers that she knew from the online magazine. Her excitement began to motivate me to get some gear and join her on her travels. I didn’t really know she was just a beater who had little to no experience. As it turns out, we learned together last summer and met some amazing people. . . Mostly Dirtbags! We joined a local paddling group, but more energy was spent catching up with the Dirtbags than the local organization. We’ve learned a lot together and had a blast our first year. I’m sure we’ve grown closer, quicker because of the culture we’ve been involved with than we would have if we didn’t share the love of the whitewater. We spent last year chasing whitewater with our kayaks, and while still nowhere near masters, we’ve decided to make pushing rubber our goal for this year. We plan to do this together forever, and the raft will help us include the kids a lot easier while we learn what the hell we’re doing out there. Michelle: “On our first date, I showed up to Tommy’s house with boats loaded to paddle. Since then our love of the sport and each other has grown. To have someone that loves the same crazy adventures in life as you do is amazing. We get to spend our time together learning the water, enjoying each other, and meeting new friends. We plan all vacations around whitewater events, which would not happen if we didn’t both share the love of whitewater. We figured out early that we can incorporate his love of music festivals to both of our love of whitewater. We are a team and compliment each other in so many ways. He fills my gaps and I fill his; together we are one. I am so grateful to have this amazing man in my life. The day of the Jess Race (Not-NPFF Race) we had not planned to paddle. I woke Tommy at 6am to say, “We are paddling today.” After a great night at the film festival and many beers, his reply was, “OK, I’ll get ready…” as he rolled back over to go to sleep. When he got up, all the gear was packed and ready to go. He said, “I guess we are paddling.” To have that person in your life that is a partner in everything you want to do is what makes the experience of the adventure that much greater. Although we weren’t in the race we knew we would have a great day on the water with each other. After we met up with our fellow DBP friends, Mike, Kelly, and Wes, only Wes made it to registration. So, as with any day on the river, you go with the flow of things. The four of us (Mike, Kelly, Tommy and I) had a great time enjoying a beautiful day on the Korn (Elkhorn Creek) watching the racers pass. Half way down the creek we met up with some fellow DBP that were gracious enough to provide some much needed beverages. Brent took our picture without us realizing, and then tracked us down later that night at the film festival to make sure he gave it to us. He wanted to make sure that we saw the love we expressed. The picture speaks for itself. The love of each other and the love of the water. We are incredibly lucky to have found each other and have our families to share the love of water. My little Gigi, only three, loves the water and asks to go boating every time we cross a creek. She says, “Can we go to church today Mommy?” She has claimed her boat and paddles it with my assistance. Being able to take our family to the river and camp is the highlight of the summer. Last season at the DBP Ice Breaker on the Pigeon hosted by ChillyWater Larry, we got to see a shy, introverted little boy break out of his shell. 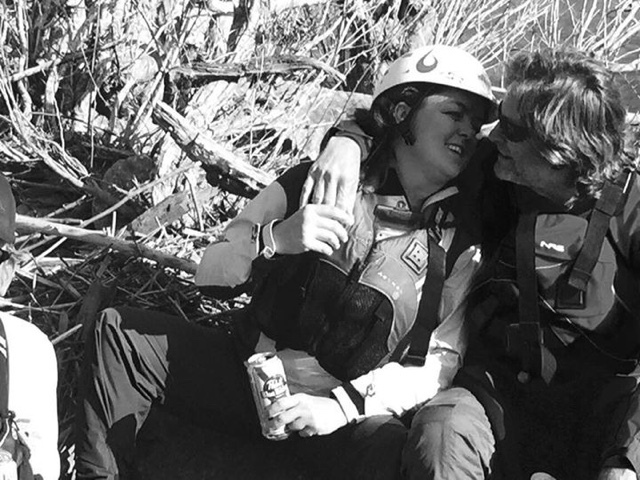 Karak, Tommy’s son, fell in love with rafting. He surfed and paddled with new friends. The smile on his face was priceless. All sorts of great Spring themes in there. It’s always fun to paddle Class II with new kayakers, (or in Michelle’s case that day, Packrafter) and see them succeed and have fun, especially for a longtime safety boater like me. What a perfect day on the river! We’ve got some awesome articles coming your way this month, including our report from the NPFF, as well as results from this year’s Ganga Kayak Festival in Rishikesh, India. There are some entertaining essays and interviews in store as well, along with coverage of Canoecopia in Madison, WI. We are also pleased to announce our support of International Rivers’ DAY OF ACTION on March 14, 2016. 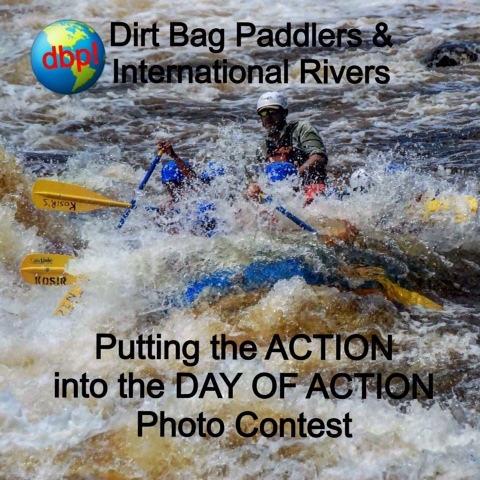 Dirt Bag Paddlers on Facebook announces our “PUT THE ACTION INTO THE DAY OF ACTION PHOTO CONTEST”, starting NOW! 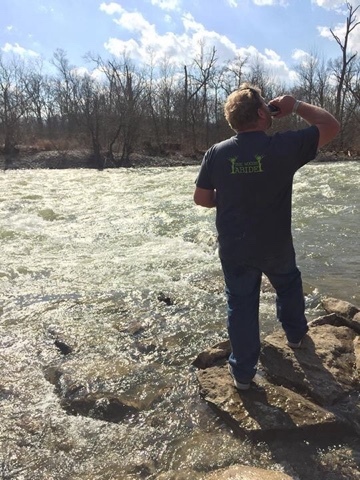 Post your own photos of you and your crew out enjoying your local river, telling us where in the world you are located. 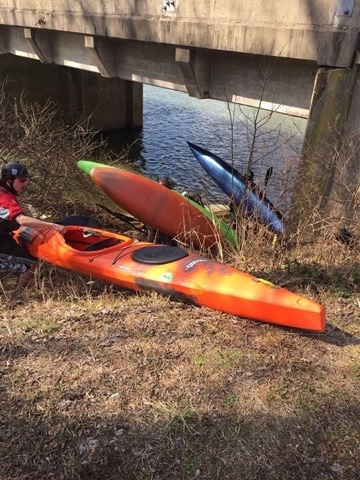 We will message you for your info, and assemble the photos and list of worldwide dirtbag river lovers to send of to International Rivers as part of their celebration. Then, we will pull one name out of a helmet to select our winner… Stay tuned for details on the great prizes involved! And get posting and sharing!